SYNOPSIS (via Penguin Books NZ website): It's the year 2044, and the real world has become an ugly place. We're out of oil. We've wrecked the climate. Famine, poverty, and disease are widespread. Like most of the humanity, Wade Watts escapes this depressing reality by spending his waking hours jacked into the OASIS, a sprawling virtual utopia where you can be anything you want to be, where you can live and play and fall in love on any of ten thousand planets. And like most of humanity, Wade is obsessed by the ultimate lottery ticket that lies concealed within this alternate reality: OASIS founder James Halliday, who dies with no heir, has promised that control of the OASIS - and his massive fortune - will go to the person who can solve the riddles he has left scattered throughout his creation. Disclaimer: I read this book as part of The Booklanders NZ book club and did not receive a review copy. All thoughts are my own and haven't been influenced by any outside sources. When this book was chosen as a Booklanders NZ read I can honestly say that I was thrilled. It contained so many elements that I know and love that I couldn't wait to get my hands on a copy. 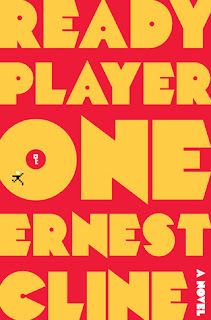 Although the book didn't disappoint Ready Player One was a little slow to start for me, I found myself putting it down and picking it up again a few times during the first 50 pages. Once the storyline got going, however, I couldn't put it down. With all the information that is thrown at you (especially if you didn't grow-up/experience 80's culture), it does kind of begin to feel like a history lesson, but Cline mixes the story with the history so well that I actually found myself looking up the music/TV shows/movies/games/etc that were referenced so I could be pulled further into the story. About halfway through the book I worried that it would be a duology, the speed had picked up, sure, but I had this sneaking suspicion that we wouldn't reach the end by the end of the book. Luckily for me, who tends to favour standalone books, we did get an entire story in just 374 pages and I was extremely pleased with that outcome. Something that did bother me about the book, however, was that there seemed to be no time between the 80's and when the book takes place in 2044, other than some technological advances. I understand completely that there's an obvious reason for this, the hunt for Halliday's egg centres around the 80's because that was all Halliday was obsessed with... BUT something about that bothered me. Yes, every 'gunter' would have to become obsessed with the 80's in order to win the competition but it felt sometimes that Cline could have thrown in some other references as well. When mentioning that there were 'planets' in the OASIS that were modelled off of literary/gaming locations the narrator only mentioned those that would have been recognizable to people who had knowledge of the 80's but didn't include anything from any other decade. Considering that the book was published in 2011 I felt some other references could have been made in order to make learning about a new decade less daunting for kids who had grown up in the 90's or 00's and were reading Ready Player One. Regardless of this one tiny point, that is really me clutching at straws, I thoroughly enjoyed Ready Player One and if it's on your TBR then be sure to check it out sooner rather than later as it's to be made into a movie early 2018... and we all know it's better to read the book first... right? The friendships in Ready Player One may be my favourite aspect of it. A lot of us live in a world where our closest friends can be thousands of miles away and could have a different first language than you do, but Ready Player One completely encourages these friendships and shows that they're just as real as friends that you make in "the real world". Not only that, but the friendships felt genuine and weren't just the same friendship repeated with different characters. If you're considering picking up Ready Player One I'd definitely tell you to go for it. It'd been sitting on my TBR for the longest time and I regret not reading it sooner. If you're the kind of reader who loves a dystopian setting with lots of video game references and awesome technology then this is the read for you.